Players who are actively in the playoffs are asked not at attend to ensure no eligiblity issues. We will communicate out practice schedules so you may join after your season ends. Registration will open 45 minutes before each session. We are looking to fill our summer basketball rosters with committed and dedicated players looking to improve their game and grow as players. The Tucson Heat are Tucson’s oldest club team starting over 20 years ago with a mission to help players not only succeed on the court, but off as well. We have had numerous alumni that have gone on to successful college careers and look to bring in more young players to our program. If you are interested in this opportunity please come see us at our tryout. Tryouts are not over, we need more HS players. Did you miss our tryouts? Not to fear we are still looking for players for our Boys and Girls HS teams. We have 5 open roster spots for our Girls team and a variety of spots available at all Boys HS age levels. If you are interested in trying out for the Heat please come to one of our practices and see if the Heat is for you. All practices are at La Paloma Academy Lakeside, 8140 E. Golf Links Rd. For more information or to contact the Heat just use the Contact tab above. 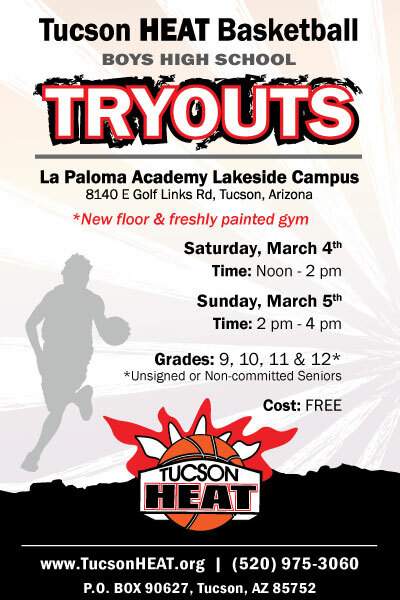 The Tucson HEAT will be having boys HS tryouts on March 4th and 5th at La Paloma Academy Lakeside Campus. This tryout is for boys in the current grades of 9-12. Unsigned or non-committed Seniors, please. This is a FREE HS TRYOUT. For more information please call (520) 290-9003 or (520) 975-3060.